It's rained almost every day this month, including all weekend in Southampton. 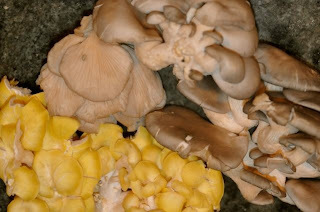 We decided to go up to the Sag Harbor Farmers Market on Saturday (open 9am-1pm), and pick up a few fresh and pantry items for Saturday's dinner....Yellow and blue oyster mushrooms from the inspirational David Falkowski at Open Minded Organics, an organic mushroom grower that serves East End farmers markets, farm stands and local restaurants, garlic scapes that were bright green and crisp from Quail Hill Farm in Amagansett PLUS several vinegars made from local wine grapes and herbs from A Taste of the North Fork. Not really sure what I was going to make for dinner, driving from the market Mom and I brainstormed the notion of a mushroom-centric pasta recipe -- after all we were going to house to eat meat barbeque that Henry picked up at the Town Line Barbeque in Sagaponack - beef short ribs and thick cut onion rings, coleslaw and chips. A vegetarian dinner with a pound of mushrooms sounded like the best way to help moderate the abundance of lunch calories for an overall more balanced food day (I'll still be making up for it on Sunday). At the last minute, we decided to add the tomato pesto which I had in the pantry -- the three tablespoons of the magical sauce made the pasta and grilled mushrooms and scapes truly divine!!! Set up a large pot of salted water to cook the pasta. Prepare the sauce. Brush mushrooms with olive oil and grill over a medium heat being sure to turn often so they don't burn. Move the mushrooms to a plate as they are cooked through and set aside. In a large saute pan, heat butter to bubbling on medium, add cut garlic scapes and cook until chewable but still firm, add pepper flakes and set aside pan. While the pasta is cooking cut up the cooked mushrooms into 1 inch bite sized pieces and reheat the mushrooms with the garlic scapes and butter in the saute pan. Lower heat and add three tablespoons of tomato pesto, pre-made in a jar or make your own, and incorporate into the mushroom and garlic scape mixture. Keep warm over a low heat until pasta is cooked. Drain the pasta when it is firm and ready to eat. Assemble the pasta. In a large bowl toss one-third of the pasta, one- third of the mushroom, scape, tomato pesto and butter mixture and one-third of the grated cheese. Repeat with another one- third of the ingredients. Taste. Add salt and pepper, as needed, then stir in the last third of the pasta and last third of the mushroom mixture and depending on your taste add remaining cheese or more salt and pepper. Serve with grated cheese on the side. Check out the short video below about David's organic mushroom farm.